Febian Brandy feels Walsall's recent demanding match schedule has helped the Saddlers build their current momentum. 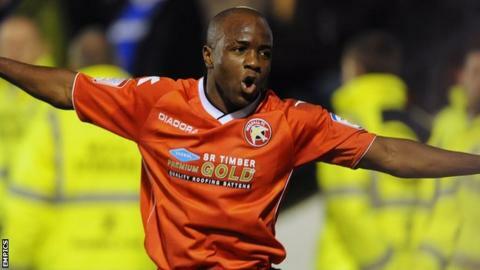 The 24-year-old striker bagged his first career hat-trick in Walsall's 5-1 demolition of Notts County on Saturday. Walsall have now won five and lost just one of their last nine league matches, dating back to 14 December. "When you're doing well it doesn't matter when games come Saturday, Tuesday, Saturday, Tuesday - in fact that's what you want," said Brandy. The win at Meadow Lane lifted Dean Smith's Saddlers into the League One play-off places. Brandy told BBC WM: "Obviously as an individual I was happy to get a classic hat-trick, left foot, right foot, header, but overall we're just glad to get the three points. "The pitch wasn't the greatest but ,with the football we play, we're capable of winning on any sort of pitch. The main thing is we have that team spirit, and if we have to win dirty, we'll win dirty." Brandy's goals could go a long way towards repairing his relationship with the Walsall supporters. The former Manchester United trainee did not endear himself to the club's fans when he left Walsall for Sheffield United last July, and was booed when he returned to the Bescot Stadium with his parent club on New Year's Day. Walsall manager Dean Smith admitted he consulted his players before re-signing Brandy on loan earlier this month. Brandy said: "The fans were a bit edgy when I left, but that's part of football. Since I've come back they've have been supporting me well. "We only missed out on the play-offs by four points last season, despite having a run of 17 games without a win. So we're in a good position, but it's the end of the season that counts."